In this example I’m going to show how to create a tab that will show any external webpage as USD hosted control, for variety (this time) I’m going to place the control in the right panel of USD. But the same approach could be used to show a webpage in the main panel. 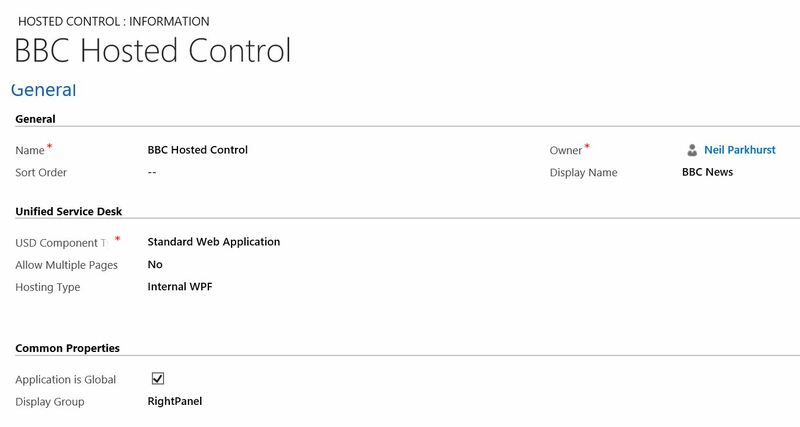 Create a hosted control to hold the website. 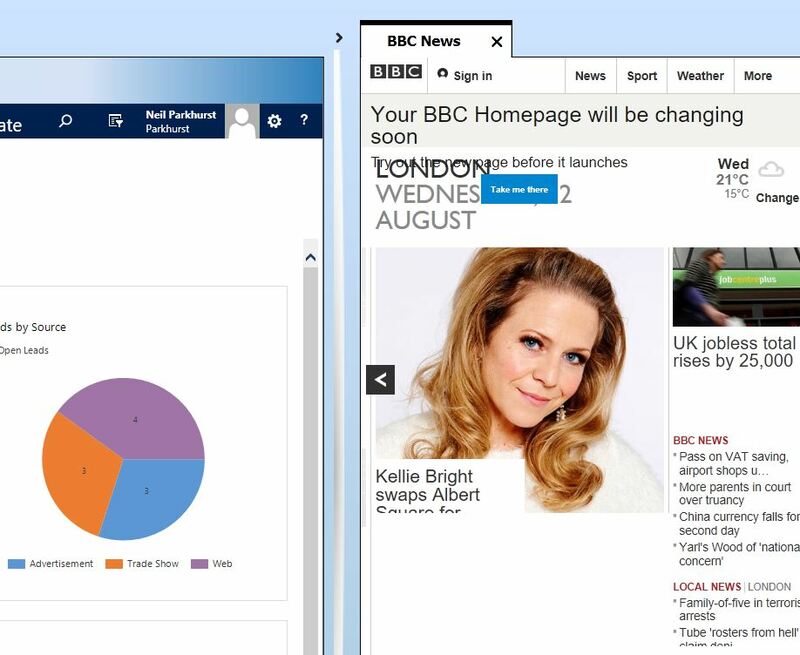 Create an action to display http://www.bbc.co.uk in that hosted control. Call that action to event when USD loads. Note: You could also call the same action from a toolbar button! Step one in my case is to create a hosted control ready top accept the bbc website and for that control to display in the RightPanel. NOTE: I am simply showing this in the right panel to give you an example of how to display something in the RightPanel instead of MainPanel. This might not actually be the best location! This time I have set the display name to “BBC News”, this will then show in the tab name in USD. Whilst mentioning this it might be worth knowing that on CRM pages you can reference the entity here! [[account.name]] would show the account name as the tab name. This time the USD component type is “Standard Web Application”. And I have decided that display group will be “RightPanel” but as already mentioned you could use “MainPanel”. Next navigate to the actions option in the unified service desk settings area. Add a new action. I’ve set the name to be “Show BBC” but any name will do! The order is 5, you see why later. The hosted control is the one you created in step one and the action is navigate. In the data portion you define the url to be displayed in the tab. So here it is “http://www.bbc.co.uk&#8221; but any address could be used. As already mentioned I could have a toolbar button that when clicked displays the webpage but in this example I am going to load the control as USD loads. So navigate to hosted controls and then select events from the navigation bar. You are looking for the DeskTopReady event. Once found add the action created in step two. Note: The order is 5 as I already have 4 other actions to run which need to come first. Finally you can test it, in my example the screen looked like the one shown below. You may notice that the BBC website doesn’t fit well into the right panel! But this is just a demo!! Hi can you guide me on how to use the $Expression for the URL data? I would like to populate the few values of my new form loaded in USD with my link.. I did another post called “USD – A Simple Scriptlet”. In that I build a url and show a webpage that displays the weather at a location. Meaning I needed to split the postcode with code. Depending on what you are doing, that might point you in the right direction. Please have a look and let me know. How do I “Test” the panel? It never opens for me. Does it open on any page? I guess first off, double check that you have triggered the action to show the web page. In my example I did this by adding an action to the DeskTopReady event of my global container. next, on the hosted control make sure you have set the Display Group correctly. To “MainPanel” probably. Missing this can cause the problem you describe. Failing that try running the debugger. Look at what actions are being triggered and also try running the action directly from the debugger. If you are unsure how to do this, see my other posts on the debugger. They might help you!